Description - PAVIGYM'S Performance Series Virgin Rubber Tiles are the perfect flooring option for anyone wanting something other than standard black for their home or commercial gym. Non-porous, these tiles are very easy to clean and maintain and will not harbor any mold, mildew or bacteria. Available in an interlocking tile makes these rubber tiles the perfect floor for any weekend warrior and can be installed in any room in your home in no time. Available in several colors, feel free to mix and match colors to create the customer gym floor of your dreams. Performance Virgin Rubber Tiles are backed by a 5-year warranty. Material – Our Performance Virgin Rubber Tiles are constructed from 100% virgin SBR rubber (a synthetic rubber compound that includes no latex or recycled rubber). Size – 35.43" x 35.43"
Weight – Each center tile weighs approximately 11.68 lbs. Recommended Uses – Performance Series Virgin Rubber Tiles are non-porous and very durable making them the perfect flooring option for any home or commercial gym. With a wide range of colors, these rubber floor tiles are also found as flooring in basements, playrooms, as laundry room flooring, in garage gyms, in personal training studios, as flooring for yoga studios, as P90X flooring and much more. Vacuuming any loose crumbs, dust, or debris from the rubber floor tile covering when necessary. Occasional damp mopping of the virgin rubber tile surface with a mild soap and water solution. A few recommended soaps are Dawn dish detergent or Tide laundry detergent. Note: We recommend that all of our virgin rubber floor tiles are damp mopped immediately following installation to remove any residual waxiness on the tile that may still be present from manufacturing residue. Optional: Virgin rubber tiles may be sealed with a common flooring sealer to help provide a high gloss finish and to further protect your floor from wear. Snap a chalk line on the sub floor 24” from one wall in your room. Snap another chalk line on the subfloor 24” from an adjacent wall. You should now have a pair of perpendicular lines making an approximate 90-degree angle. Anti-slip and resistant to indentations. 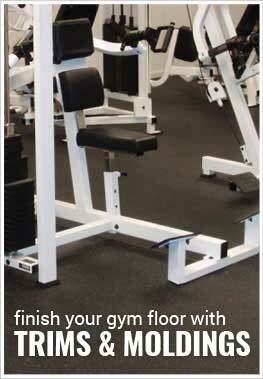 Great under treadmills and other fitness equipment.